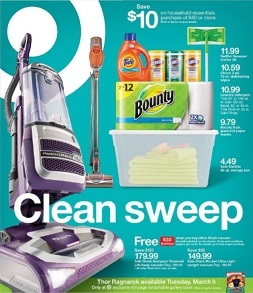 Browse the Target weekly circular sale, valid April 21 – April 27, 2019: $10.59 Clorox Disinfecting Wipes Value Pack Scented – 225ct; $9.79 Bounty 8-pk. giant-roll paper towels; $4.49 Sterilite 56 Qt Storage Tote – Transparent with Glacier White Lid; $179.99 Shark Navigator Powered Lift-Away vacuum; $29.99 6-Cube Organizer Shelf 11″ – Room Essentials; $16.99 Sterilite Ultra 2-drawer storage cart; $9.99 Room Essentials 15-pocket over-the-door hanging closet organizer; $19.99 Adjustable 3-Tier Wire Shelving – Chrome – Room Essentials; $299.99 Shark Ion Robot 720 Robotic Vacuum with optional scheduled cleaning – RV720; $140 Threshold office furniture; $119.99 Rachael Ray hard-anodized nonstick 10-pc. cookware set; $29.99 Crock-Pot programmable 6-qt. slow cooker; $30 Pillowfort twin-size comforter; and more.